14. Alfred Edward Mathews (1831-1874). A Mirage on the Plains. Tinted lithograph, Plate 13. Mathews, A.E. Gems of Rocky Mountain Scenery. New York: The Author, 1869. St. Louis Mercantile Library at the University of Missouri - St. Louis.
. 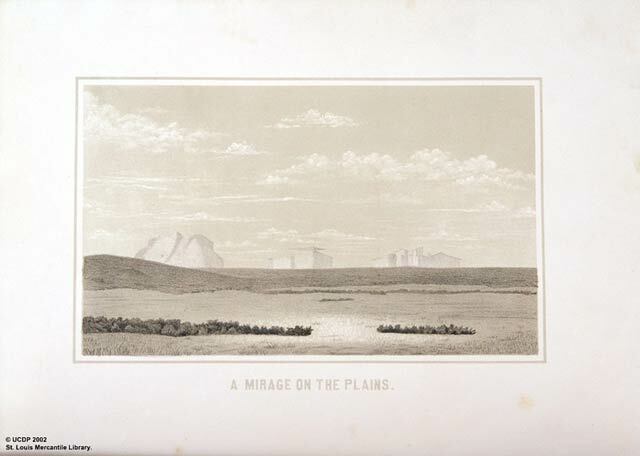 The mirage represented in the plate is the Three Buttes, changed in form -- two of them representing huge buildings with perfectly straight walls, towers and regularly sloping roofs; one of them having a singular shaped cap on the comb of the roof."